There are two fundamentally different ways of doing this. Either the workpiece is kept still and the cutter rotates or the cutter stays “still” and the workpiece rotates. The cutter could be a single point cutter or it could be a rotating cutting edge. The difference is that a single point can only cut a small amount at a time whereas a rotating cutter can cut a much deeper depth. Cutting grooves like this can, of course be done on a lathe. If the workpiece can be mounted easily on the lathe this is probably the best way to do this. The advantage of using the milling machine is that it is usually possible to manage larger workpieces more easily on the milling machine. Where it is necessary to cut a groove inside a cylinder the tool of choice would be a boring and facing head. These are expensive to buy and few amateurs would have one. Anyhow most of the things it can do can be done in some other way and that includes making grooves inside a cylinder. The boring head is effectively a single point cutter. The workpiece might be held in a three jaw chuck fixed to the milling table. The workpiece has to be concentric with the spindle. The boring head is fitted to the spindle. The cutting edge is set so it just touches the workpiece. The system is set to run at the sloest possible speed. In most cases the boring and facing head will just rotate and the cutter will not move. If the body of the head is held in the hand the cutter will slowly mo=ve out and will cut a groove. The head is calibrated and it is up to the user to let go of it when the required diameter of the groove is reached. Notice that an ordinary boring head cannot be used like this because there is no practical way of the cutter moving out automatically. In this case the workpiece not only does not rotate but it does not move in any direction. Methods where the cutter rotates as does the workpiece. All of the other methods involve a rotating cutter and a rotating workpiece. The workpiece is mounted on a rotary table. The hole being grooved must be centered on the axis of the rotary table. In many cases it may use a three jaw chuck mounted on the rotary table. 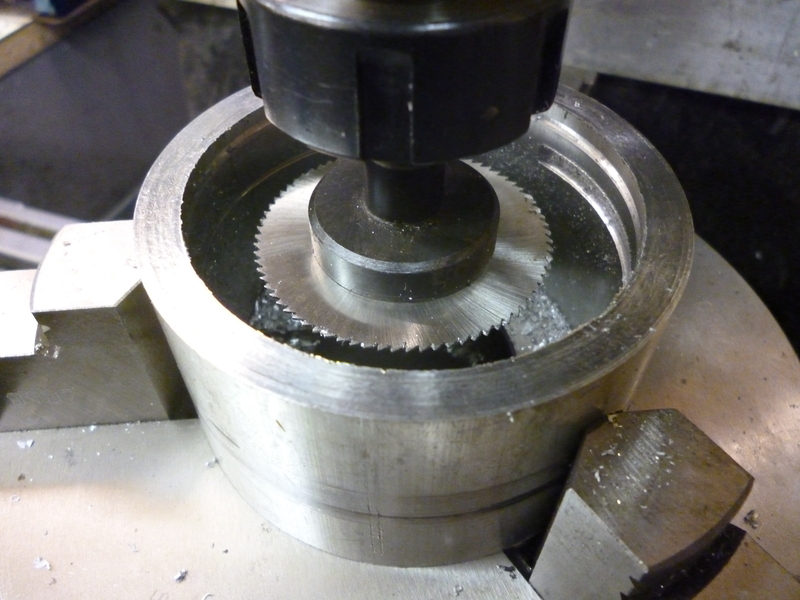 In this case the chuck will usually need to be centered on the rotary table. But the rotary table with or without the chuck is not centered with the spindle. In all cases the job starts by moving the milling table so the cutter just touches the surface of the inside of the ylinder. When the cutter starts turning the table can be moved so as to set the depth of cut.. 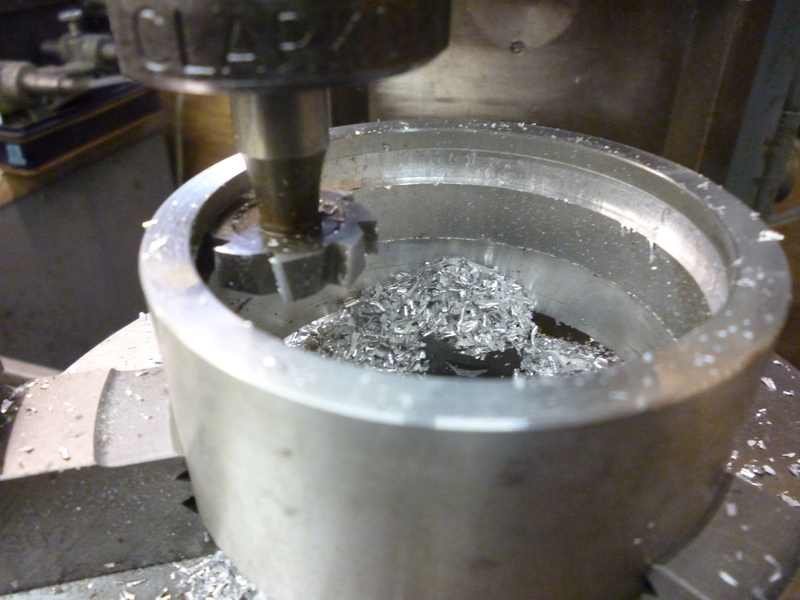 The workpiece is fitted in the chuck. The spindle is fitted with the cutting system. In all these cases the cutter cuts round in a circle the diameter of which is smaller than the bore of the cylinder. The circle that defines the groove is made by rotating the workpiece by rotating the rotary table. If the center of the workpiece is centered with the spindle, the cutter is placed in the spindle. The cutter is lowered into the workpiece. It is moved left or right till it is just touching the internal surface of the workpiece. The x direction DRO is set to zero. The cutter is turned on. the milling table is moved so the cutter is cutting. 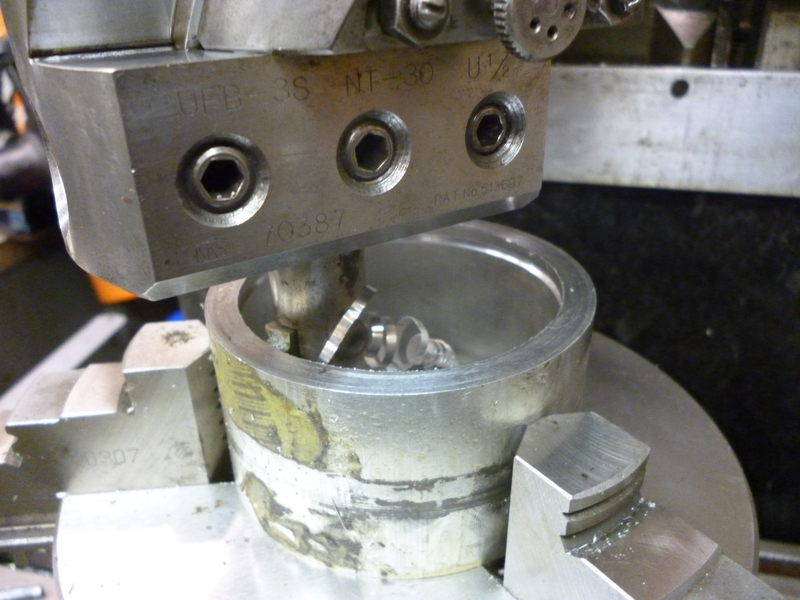 The workpiece is then rotated through one whole turn. The depth of cut can then be increased. And so on till the required depth is reached and cut all the way round. A slitting saw held on a stub arbor fitted to the vertical spindle.